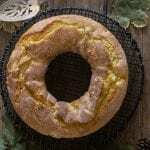 Italian Apple Cake, a moist soft full of chopped apples anytime cake. A perfect Breakfast, Snack or even Dessert Cake. All it needs is a dusting of powdered sugar! I once asked the Italian what in his opinion was National Cake of Italy. He promptly answered “Ciambellone”, with my kids nodding their heads in agreement. 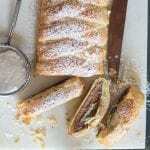 What is an Italian Ciambellone? 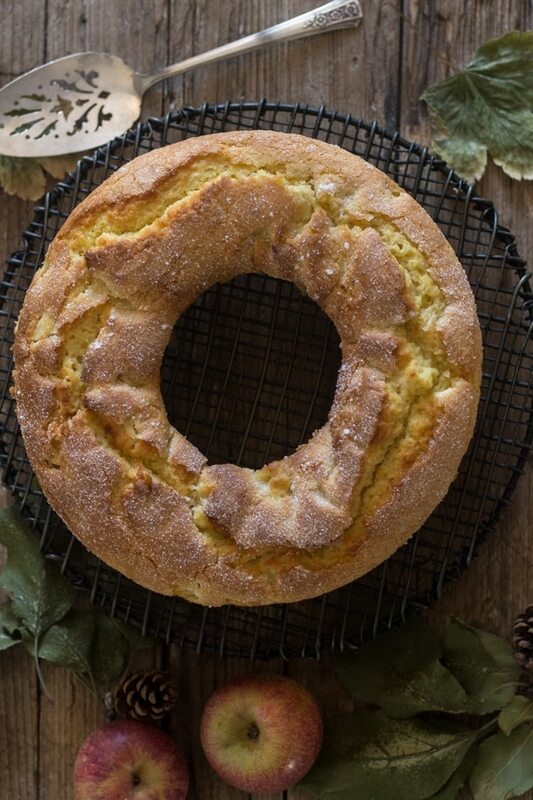 If you translate the word Ciambellone you have “Big Donut”, or in other words a Bundt Cake. Simple as that. 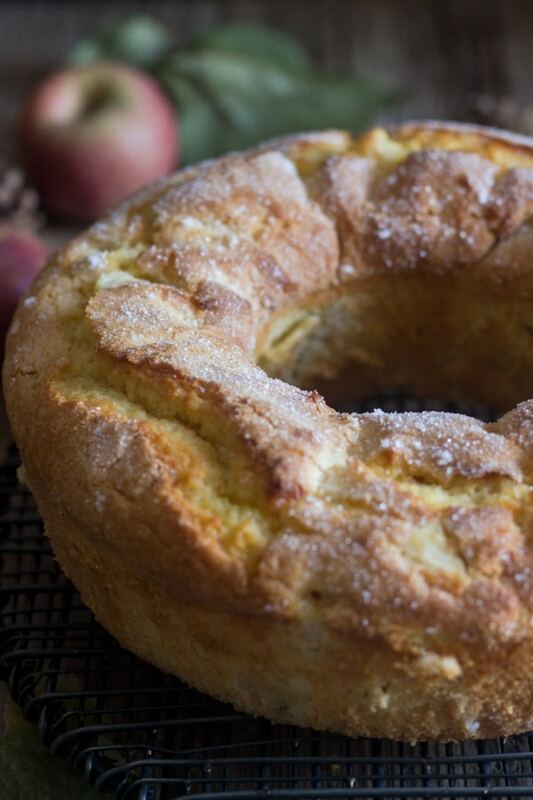 So what does this Apple Cake have to do with a Ciambellone? Well this is basically a Ciambellone with apples. And believe me everyone knows how to make an Apple Cake in Italy. 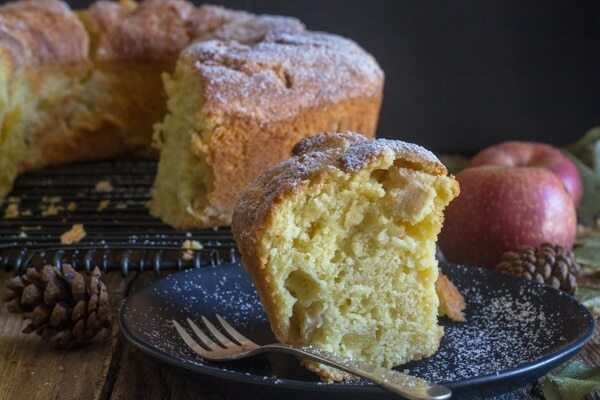 What makes this Apple Cake Italian? I actually got this recipe years ago from a friend. So to start this is an Italian Cake because it’s an Italian’s Recipe!! 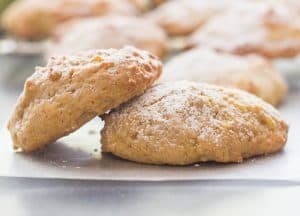 Most Italian cakes are made with oil instead of butter. 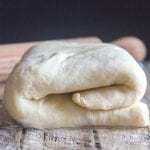 The flour is always sifted with the baking powder. 90 percent of the time lemon is an added ingredient. Just as it is in this Apple Cake. And because Italians cannot live without lemon! The finished cake is rarely drizzled or frosted unless of course you are making a birthday or Tiramisu. But most are dusted with powdered sugar. These types of cakes are often served at Breakfast and as a snack with an espresso. The perfect cake to serve when a friend comes to visit. 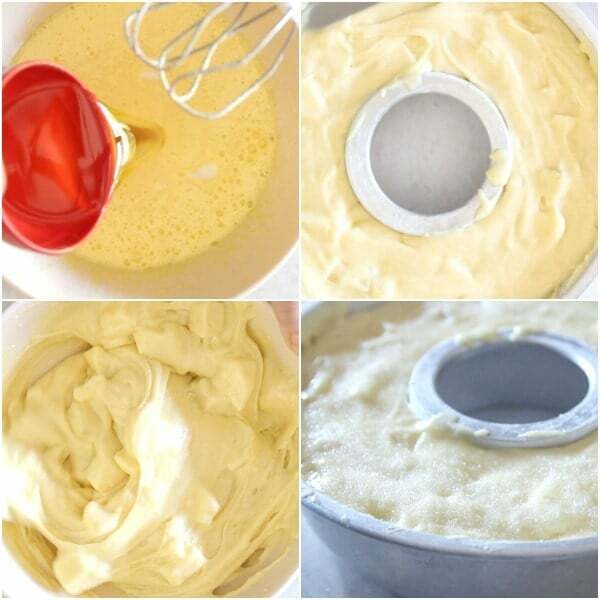 This cake can be made with one bowl, just sift your ingredients directly into the batter like all Italians do. This Cake can also be frozen, just make sure to completely cool the cake and wrap it tightly in plastic then place in an airtight freezer bag. The cake will keep up to 3 months in the freezer. Since I have a few extra people in the house this week, I decided to make the cake a couple of times. The first time I made it with 3 apples and chopped on the larger size and I used the juice of half a lemon. My eldest daughter who is not a big lemon lover, only on her fish and in her water! And never in a dessert. Crazy I know. So I decided to make a second cake with only two apples and 1 tablespoon of lemon juice. She obviously preferred the second where the rest of us preferred the first. So you decide more apples and more lemon juice or less? Enjoy! 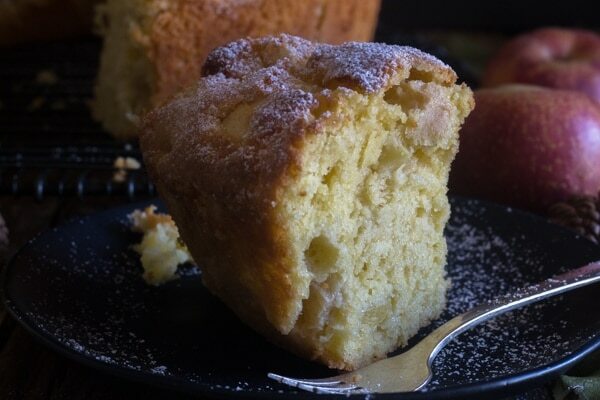 Italian Apple Cake, a moist soft full of chopped apples anytime cake. A perfect Breakfast, Snack or even Dessert Cake. Pre-heat oven to 350F (180C), grease and flour a nine inch (23 cm) bundt pan (a cake pan would work too). In a medium bowl add the chopped apples and sprinkle with the lemon juice. 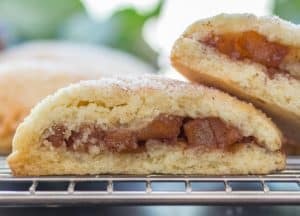 Fold in the apples, spoon into the prepared cake pan, sprinkle with a couple of tablespoons of granulated sugar and bake for approximately 35-40 minutes (check for doneness with a toothpick). Let cool completely before removing from pan. Dust with powdered sugar if desired. Enjoy! Hi Janis, thanks so much, so glad you both liked it, have a great weekend. 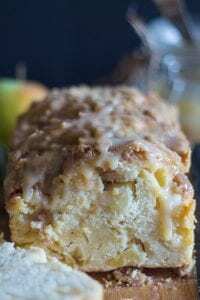 I had some apples at home and was looking for an apple cake recipe to use them. So I gave it a go tonight and it became delightfully delicious. I did not have powder sugar and the cake is without it at the end, but it was still wonderful. A perfect combination of sweetness, a hint of lemon and apple sourness. Usually my husband is not an easy one to satisfy (for him cakes are too sweet or not enough sweet), but even he was happy and liked this cake! Thank you for this recipe and I will definitely make it again and again! Hi Noriko, Thanks so much, so glad you both enjoyed it. Hi Lynda, yes you can although you should probably add a couple of tablespoons of milk, since sour cream is thicker than regular yogurt and be sure to use regular sour cream and not low fat. Hope that helps. Hi Michelle, thanks so much, so glad you enjoyed it and my recipes. Glad you discovered me too! Have a wonderful Sunday. I love apple desserts and I’ll be making this cake again and again!! Delish! Hi Liz, thanks so much, so glad you enjoyed it. Have a great weekend. This cake is incredible. Baking AGAIN for CHristmas! How much brown sugar and lemo did you use ? Hi L, I’m sorry but I didn’t use brown sugar. And I used the juice of 1/2 a lemon about 2 tablespoons. Hope that helps. Happy New Year. Great recipe, made it and was a big hit. I will be making it again for sure. 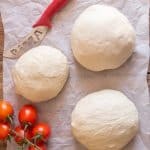 Love the sound of this recipe! If I were to make this in a cake pan rather than a Bundt, will I need to alter the baking time to allow for the centre to cook? Hi Robin, I would check it after 35 minutes with a tooth pick in the centre and if isn’t dry then leave for another 5 and check again. Hope that helps. Let me know how it goes. Hi Tina, thanks so much, glad you love them. Have a great day. 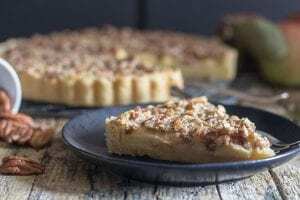 Great taste and an easy recipe steps to follow! Hi Chuck, thanks so much. Glad you enjoyed it. Hi Rosemary. I am living in Athens and i would like to tell you congratulations for your amazing blog. I just made the apple cake and it was perfect. Thanks a lot for the recipe. Such an amazing cake! Thanks for the recipe. Hi Taryn, thanks so much. Have a great weekend. 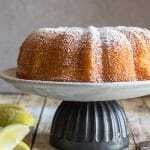 I love that there is lemon in the cake! Apples and lemon go so well together. And, simple cakes like this are my favorite. No need for frosting! Hi Stef, thanks so much and yes the combination of lemon and apples is so good. Have a great weekend. Thanks so much for the recipe it looks amazing. Hi Vanessa, thanks so much I hope you enjoy it. Thanks so much for the recipe, I made this last night and it was so good. My whole family loved it. Hi Carol, thanks so glad you all enjoyed it, have a great weekend.